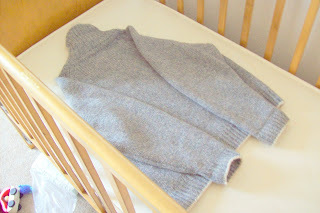 We use a thrift store wool sweater for a waterproof layer in the kids' cribs over their natural mattresses. This one was 1.99 at our Goodwill, which I washed on gentle/hot and it didn't shrink much. My kids stay generally near the head of their cribs when they sleep, so I only use one. I lay it like this (I actually usually fold the sleeves so they're on the outside of the body, along the side, to cover more) and then put the crib sheet on. I haven't had a problem with it moving around at all, and we've never had a leak go all the way through . Wool is great because it's naturally antimicrobial and doesn't wick, so it may get wet but doesn't wick to the mattress underneath. Crib mattresses are something that I'm concerned about, since the chemicals in conventional mattresses may be linked to SIDS. Even if the mattress/SIDS theory isn't completely proven, I don't think that it's a great idea for our quickly-developing children to be right against toxic chemicals for an extended period of time every day. 0 Response to "Cheap and Easy Natural Moisture Proof Crib Mattress Cover"